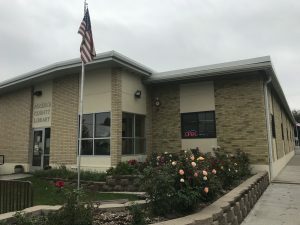 Established in 1919, Rosebud County Library prides itself as being a major community partner in Forsyth and all of Rosebud and Treasure Counties. Our library is an ever-evolving modern, progressive library that offers a wide range of services that includes a large collection of both non-fiction and fiction books, an impressive assortment of Westerns, audio-books, periodicals, DVD’s and music CD’s. Computers are available to the public in both desktop and laptop options, you can borrow iPads and tablets for in-library use, and we offer free internet and WiFi. We are a site for testing, and proctor tests in both digital and paper form. Staff is available, by appointment, to assist patrons with their devices and downloading e-books and audio books or for more time consuming computer training. We offer monthly teen and senior citizens programming and a wide array of special programming and events including: speakers; art shows; book sales; movie showings; quilt shows; music performances; humanities programs; and Summer Reading Program for all ages. We proudly collaborate with area schools and volunteers from the community in both our weekly and our special programming. We also offer a large Community Room with a kitchen as an affordable rental option, as well as a smaller conference room. Stop by the library and take advantage of our many free services! From September through May, we offer regular weekly programming for children and teens. social time, toys, games, snacks and a monthly craft. Hungry High Schooler’s Book Club: Mondays during FHS Lunch Break. After School Program (Elementary Ages): Mondays after school. Rosebud County Library is governed by the Rosebud County Library Board of Trustees (Library Board). The Library Board consists of five members appointed by the Rosebud County Commissioners in accordance with the Montana Code Annotated. Membership of the Library Board represents geographical areas of Rosebud County, with one member being from Treasure County, per the “Agreement for Library Services”. With the exception of the month of July, meetings of the Library Board are held monthly. Rosebud County Library will provide its community with access to quality library services and programming. The library operates for the betterment of all residents including children, teens, young adults, young families, adults, and senior citizens. The library serves as a center for lifelong learning, technology, and community gathering.